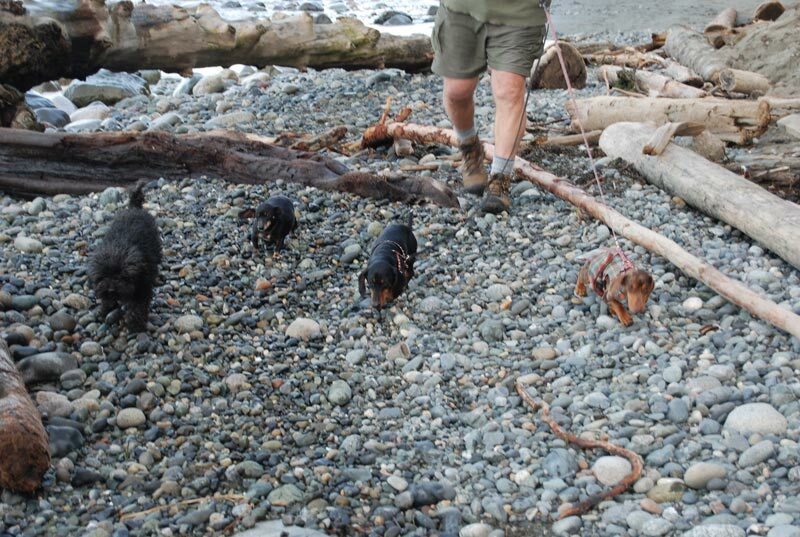 We were in Port Townsend so we called first Guest Adventureweiner Sadie and her mom to meet up for a hike. When we met at North Beach we knew the tide would be in but we weren’t thinking that the 10 feet of exposed beach would be really sloped and covered with fist-sized stones. It was but we made our way down the beach anyway clumsily twisting our ankles (us) and gracefully picking a path between the stones (the dogs). When we got down to the point it looked like we weren’t going to be able to go much further. We were optimistic that if we could just get past all the downed trees and scale part of the cliff we would be rewarded with and amazing expanse of sandy beach on the other side. Knowing we were being delusiononally hopeful anyway, we weren’t surprised to see only a sliver of beach on the other side being pounded by waves. We admitted defeat and turned around. Two bigger, non-weiner dogs were with us too. The Doberman likes rocks and Sadie’s Mom was throwing them out in the water for him where they would land with a big splash. Turns out Sadie likes splashes. When the rocks would crash into the water she would go nuts with excitement. She barked the whole way back down the beach. We suspect that Gretel was never taken to the beach in her former life so this was likely the first time she had ever seen and smelled one. She loved it and was so curious. When Sadie’s Mom started throwing rocks for the Doberman she saw how much fun he was having. She watched him intently and you could tell the little gears in her head were turning. She so badly wanted to go out in the water to see what all the excitement was about. I tell ya, we have seen for a while now that Gretel the acrobat has no fear. Chester hates getting wet and he have heard the same stories from other weiner dog owners. Apparently Gretel doesn’t mind, or doesn’t know any better, because she ran out into the water just as a wave was coming in (and these were big winter waves mind you). There was a big sploosh and Gretel disappeared under the froth for a second. I expected her to come running out of the water and never want to go back but she just stood there. She wasn’t phased at all and was still intent on finding out what the other dog was doing out there. It was pretty funny and brave of her. Now we know to be sure to never let her off the leash at the beach for fear that she might run out into the water when she is excited and be washed away by a wave. Wow, that really is an adventure! We are glad Gretel didn’t mind getting dunked under the water. Maybe you doggies should wear life jackets on the beach!!! P.S. Today is the last day to enter and pick your prizes for our raffle to raise money for Apollo! It sounds like you had a wonderful day. We’re insanely jealous of your easy access to the beach. We’ve been landlocked all of our lives and are seriously considering San Diego as our next landing spot. So glad to hear Gretel enjoyed the big wave!